When Sir Arthur Conan Doyle first began writing Sherlock Holmes stories back in the late 19th century, 221B Baker Street didn’t exist. While Baker Street itself existed, and still exists today, the numbers on the street back when Doyle wrote the Sherlock Holmes novels and when Holmes was supposed to reside there (1881 to 1904 according to Doyle’s original stories) only went into the hundreds. It would seem that Doyle intentionally picked an address that didn’t exist. This all changed in the 1930s when the street numbers in London were rejigged and reallocated to make things a little more streamlined. During the reallocation, a recently constructed building for the Abbey Road Building Society (aka Santander), known as “Abbey House” was awarded all of the odd numbers between 219 and 229. Because the address 221 Baker Street now existed, all of the mail that fans across the world had inexplicably sent to Holmes not knowing that he didn’t exist, now had a place to be delivered. It’s noted that as soon as the bank began trading from the building on March 18, 1932, they were inundated with dozens of letters addressed to Holmes. While most of the letters were basically just fan mail or nice messages wishing the detective well, the bank were surprised to find a decent number of people who’d written to ask for Holmes’ help. Now you’re probably thinking that a large, faceless corporation like a bank would have dismissed these letters as an annoyance and have them shredded or something, but that didn’t happen. Instead, the bank went out and hired someone to serve as “Sherlock Holmes’ personal secretary” and charged them with reading and responding to the mail. Rather than sending a stock reply on bank stationary explaining that Sherlock Holmes wasn’t real, this secretary would write back explaining that Holmes had retired to go live in the country and raise bees on a farm in South Downs in Sussex. As it turned out, the bank quite enjoyed the attention of sharing their address with one of London’s most famous fictional residents, so much so that they had a small plaque commissioned to sit outside the building and on their 150th anniversary even paid for the creation of a bronze statue that currently sits outside the Baker Street entrance to the tube. In 1990, though, things turned a little sour when the Sherlock Holmes museum opened nearby and suddenly decided that they should be the only ones who were allowed to open Sherlock Holmes’ fan mail. Although the museum was located between 237 and 241 Baker Street, they argued that as an authority on Sherlock Holmes, there were better equipped to deal with his correspondence than a billion dollar company with virtually unlimited resources that had been doing an admirable job at exactly that for about five decades straight. The museum even put a plaque outside their building declaring that the museum was the real home of Sherlock Holmes. The courts didn’t agree and they ruled in favour of the bank, since, well, they did technically own 221 Baker Street and it wasn’t their fault that people kept sending letters there to a guy who didn’t exist. The museum fought this decision for over a decade until 2002, when the bank, which was then known as Abbey National, moved its headquarters to nearby Triton Square. 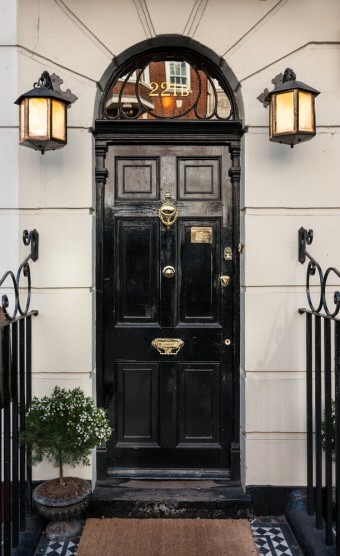 By this point, Westminster council had grown pretty sick of dealing with the issue and when the bank moved, they granted the museum exclusive rights to use the address 221B Baker Street, even though the museum itself still resided between 237 and 241 Baker Street. The museum is still there today. Arthur Conan Doyle’s family didn’t like the idea of a Sherlock Holmes museum because they weren’t overly keen on the idea of anything that perpetuated the idea that Holmes was a real person. That said, Doyle’s daughter Jean did help officially help open the museum in 1990. Although Sherlock Holmes is synonymous with the phrase, “Elementary, my dear Watson”, he never actually used that string of words in any book written by Doyle. The first known time the phrase was used was in a book called, Psmith, Journalist, that had nothing to do with Sherlock Holmes or Doyle. Santander: who was Abbey’s most famous customer? This was a really interesting article. It’s quite heartwarming that the bank went to such efforts to answer a fictional character’s mail. As a long time Sherlock Holmes fan, I enjoyed reading this – thank you. Wow, so P.G. Wodehouse coined “Elementary, my dear Watson”? The number 221B over the door of the Sherlock Holmes Museum is quite legitimate – but it isn’t the address. It’s the name of a company, registered for that purpose only. 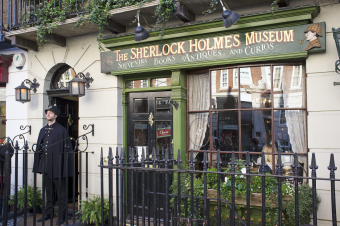 The museum’s address is 239 Baker Street, despite the proprietors’ claim to have changed it to 221B by special dispensation. The museum was officially opened by Dame Shirley Porter, the (now) disgraced former leader of Westminster City Council. In 1991, Dame Jean Conan Doyle officially opened the Sherlock Holmes Museum at Meiringen in Switzerland, near the Reichenbach Falls. She had laid the foundation stone four years earlier, and was joint Patron of the Museum, with the Sherlock Holmes Society of London.